My blog last month discussed buying new running shoes and how it really doesn’t need to be that complicated. So, now you have the running shoes what is the best way of lacing them up??? for anyone who follows Axis Podiatry on social media, particularly my Facebook page (https://www.facebook.com/axispodiatry) you will have seen last year a video I recorded where I simply showed you how to use that top hole on your trainers for extra heel lock and less slippage – it went viral, who knew??? Following on from that I was asked a lot of questions about different ways of tying your laces for different foot problems and different foot types. So this first photo shows how to use that top hole I have just mentioned. 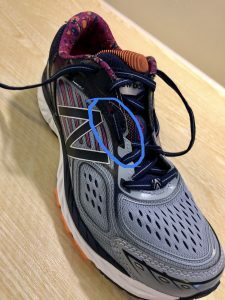 Heel slippage – at the top of your laces you simply feed the lace on the same side through that extra hole to create a loop and then you thread the lace from the opposite side through the loop created as seen in the yellow circle and thats it – easy peasy. 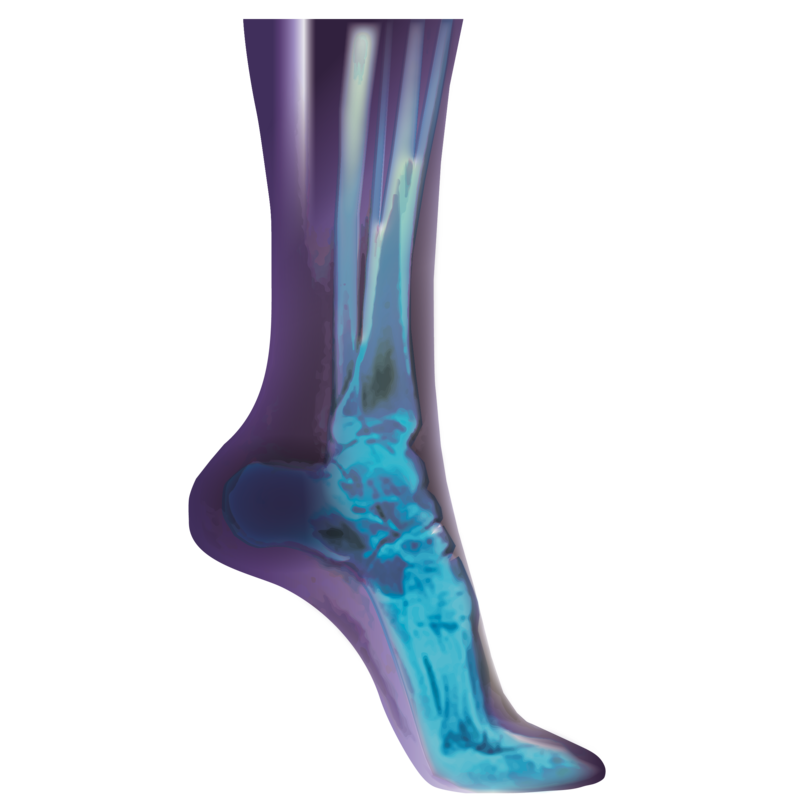 This is also really useful if you do wear orthoses which raise you up under your heels as it just stops the heel rising up as much. 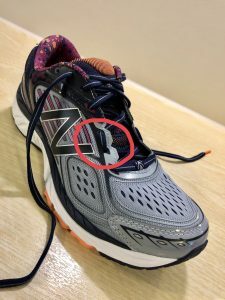 The following photos demonstrate different ways of lacing up your running shoes for different problems or foot types. 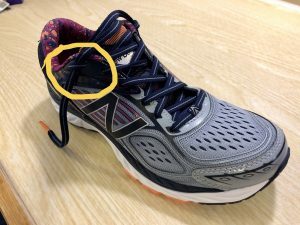 I’ve picked the most common and I’ve shown you how I did it on my new pair of road running shoes and I’ve tried to highlight the important difference from the standard lacing technique. 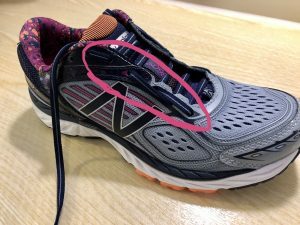 Wide forefoot – this method of lacing gives your forefoot more space. Rather than crossing the laces from the bottom you just go straight up the side for the first couple of holes in a vertical way and then start to criss cross them as usual. Seen in the green circle on the photo. 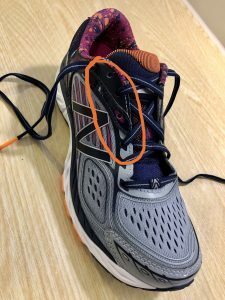 Wide feet in general – The best way of creating more space if your feet are just wide in general is to use alternate holes when lacing as shown in the orange circle on the following photo. High arches – If you have high arched feet and find the tops of your feet hurting during or after a run then this is the best way to create some extra space at the highest point. Instead of crossing your laces all the way up try taking the lace vertical on either side at the highest point of your feet. This could be the 2nd to 3rd holes as in the red circle or the 3rd to 4th holes as in the blue circle of the following photos. You may need to experiment on a couple of runs to work out which is most comfortable. Swollen feet – a problem a lot of runners get is swelling to their feet particularly in the latter stages of longer distances. This method is recommended for helping them stay comfortable even when they swell. Instead of the crossing of laces its like a ladder technique so the lace only runs horizontal and vertical. You can see the vertical laces in the pink circle on the following photo. 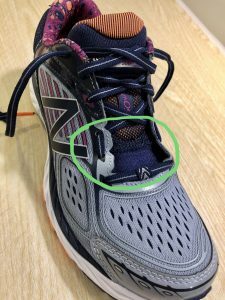 Don’t forget you don’t have to have both shoes laced up the same way, you can adapt the laces to different problems on either foot and however you decide to lace up your running shoes, get out there, enjoy your run and if your feet are uncomfortable then hopefully this blog has given you some suggestions.